We use chemical engineering, nanotechnology, genomics, and molecular biology to treat disease. How can we make genetic therapies (siRNA, mRNA, CRISPR, etc) safer? We need to deliver them to the right tissue using nanoparticles. So how do we find nanoparticles that can deliver drugs to a particular tissue? We make thousands of chemically distinct nanoparticles. We have developed screening systems using high throughput microfluidics and DNA barcoding to study how hundreds of LNPs work in a single mouse for the first time. How do test hundreds at once? By 'barcoding' LNPs, and using DNA deep sequencing to measure where they all go at once! For example, the 'heat map' above shows how dozens of LNPs deliver drugs to different cell in vivo - we measured this at all once. We now regularly generate thousands of in vivo drug delivery data points per experiment; this is hundreds of times more in vivo data than a typical experiment. Why is this important? We can study thousands of nanoparticles in vivo to quickly find candidates that deliver genetic drugs to new tissues. We have developed several barcode screens. Screen one measures nanoparticle distribution (where particles go). Screens 2 and 3 measure where the particles function (which particles deliver mRNA or siRNA that functions in the cell). We can also use barcodes to improve the stability of the drugs themselves. So what's a typical experiment? We inject ~200 nanoparticles into a mouse, isolate 30 cell types from that mouse, and deep sequence all 30 cell types, thereby generating ~6,000 in vivo data points. We then use custom bioinformatics to analyze which nanoparticle traits (size, composition, etc) affect delivery in vivo. Based on these bioinformatics data, we make another nanoparticle library. Once we find a really great nanoparticle, we see how well it functionally delivers siRNA, mRNA, Cas9 mRNA + sgRNA, and / or sgRNA in vivo. 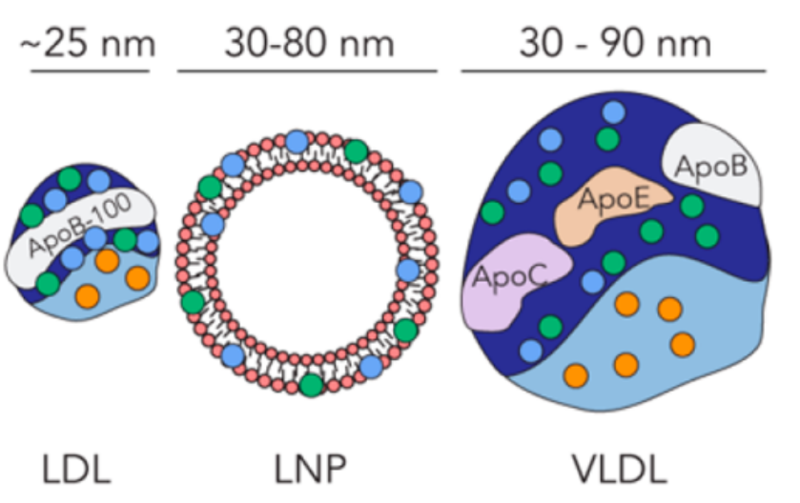 Using this approach, we have identified nanoparticles that deliver siRNA, mRNA, Cas9 mRNA + sgRNA, etc., to many different cell types, including non-liver cell types! When nanoparticles carrying genetic drugs are injected, the body dictates where they go. We know physical barriers (e.g., blood brain barrier) can alter nanoparticle targeting. There is a lot of evidence that specific genes also affect nanoparticle targeting (and safety). Unfortunately, the genes that affect how well nanoparticles work in vivo are difficult to study, so we don't know what the genes are. What are we doing? We develop tools to study nanoparticle biology directly in vivo. This involves combining molecular biology, chemistry, and in vivo experiments. Why is this important? First, this is super interesting. There may be master regulatory genes that dictate nanoparticle safety. Understanding how to manipulate genes that to improve nanoparticle safety. would help siRNA and Cas9 therapies. Using nanoparticles, Cas9, siRNAs, and miRNAs, we can study how many genes work together to promote disease. How do we do this? By delivering multiple siRNAs, miRNAs, or sgRNAs concurrently in vivo. Why is this important? Many diseases are caused by combinations of genes, not a single gene. For example, we co-delivered two RNAs, each targeting a different cancer pathway, to create a 'targeted combination gene therapy' for cancer. We also designed a five gene therapy for heart disease, and reduced inflammation with Cas9 in vivo. Using molecular biology, we rationally design the genetic drugs we want to deliver. How do we do this? For example, using 'dead' guide RNAs, we can simultaneously turn off gene A and turn on gene B in the same cell using CRISPR-Cas9. Why is this important? Precisely turning certain genes on, and others off, will allow us to study how gene combinations promote disease.